It's not just a therapist directory and profile page. We have all the content, tools and systems you need to offer online therapy. 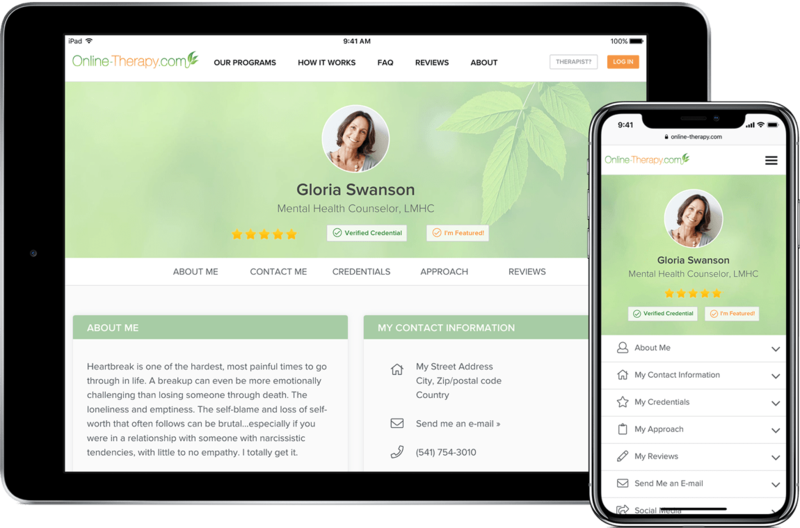 As a member, you will get listed on one of the biggest and most advanced online therapist directories - no matter where you are located in the world. This means that when a potential client uses search engines like Google to find a professional in your area - your profile page will appear! Register and get listed today! Clients will contact you from your profile page! Your profile page is the virtual front-door to your practice, where potential clients find everything they need to safely choose you as their therapist/counselor. Your contact details, work experience, education, expertise areas and therapy philosophy will be presented in a clean and appealing style. WHY IS ONLINE THERAPY SO GREAT FOR ME? A fully-supported platform that makes your online therapy business ready to go live within minutes. You pay a small flat fee each month that gives you access to the whole platform. You are your own boss. You fully decide how much you want to work, at what times and with which clients. All sensitive information about you and your clients is sent using our secure and encrypted servers. Help people that are not comfortable with exposing themselves face-to-face in the waiting room or in a therapist's office. There is no need to travel to an office. You can help your clients from wherever you are in the world. Offer your support from the comfort of your sofa! DOES THIS SUIT MY PRACTICE? Special offer: 20% discount on all plans. Are you missing something? You can always contact us with your request and we will be happy to help. What's included in the online therapy platform? Visit our how it works page for full details or feel free to contact us by email or chat. Visit our how it works page for full details or feel free to contact us by clicking on the email symbol below.